In the 1st century B.C., Vitruvius in his De Architectura [Vit62], and in the 1st century A.D., Pliny in his Naturalis Historia [Pli71], described in detail the methods of construction of pavements. Vitruvius distinguishes between pavements to be built on ground level and on upper floors. According to the Latin author, when building on ground level the soil was rammed and leveled and then three foundation layers were spread on top of it. The first layer, called statumen, was made of large stones “each of which is not less than a handful”, laid on the ground. The second layer, called rudus, was spread over the statumen and consisted of stones mixed with lime in proportion of three to one. This layer was rammed by means of wooden stamps and its thickness was no less than about 23 cm. The third layer, called nucleus, was made of powdered pottery and lime in proportion of three to one and it was about 15 cm thick. On top of the nucleus a “pavement of marble slabs or of mosaic” was laid and rubbed down. After the rubbing down, when the pavement was “completely smoothed and finished”, marble dust was sprinkled over it, and over that coats of lime and sand were applied. In case of pavements to be built on upper floors, Vitruvius recommends that no wall from the rooms of the level below have to be built right up to the pavement. In fact, this would cause the formation of cracks in the pavement as it dries or sags in contact with the solid structure of the wall [Vit62]. Pliny [Pli71] describes a kind of pavement that he defines “terrace-roof pavement”, which according to the Latin author were invented by the Greeks, who were used to cover their houses with them. In making these pavements the first step was to lay down two layers of boards running different ways and nailed at the extremities. Upon this planking, “fresh rubble” mixed with “a third of its weight in pounded potsherds” was laid. On top of this layer, another layer of rubble two fifths composed of lime and rammed down to a thickness of about 30 cm, was laid. The nucleus was then laid down with a thickness of about 12 cm, and upon that, large square stones not less than about 4 cm thick were laid. An inclination of about 4 cm to about every 3 m was maintained and, finally, the THEORY 4 surface of the pavement was carefully polished with grindstones [Pli71]. Pliny describes also another kind of pavement called graecanic. When building it the ground was well rammed down and a layer of rubble or of pounded potsherds was laid on it. On the top of this layer, a layer of charcoal was spread, “well trodden down with a mixture of sand, lime and ashes”, to a thickness of about 15 cm. The surface of this layer was then smoothed with a grindstone until it had the appearance of a black stone floor [Pli71]. In the 15th century A.D., in his Ten Books on Architecture [Alb65], Leon Battista Alberti treated of pavements referring to Pliny and Vitruvius and to the “Works of the Ancients”. In particular, Alberti describes the way to convey into cisterns or sinks the water from the surface of outdoor pavements. Then, after describing the construction of pavements according to Pliny and Vitruvius, the author reports what he says he discovered about pavements from the actual work of the ancients. He begins with a description of the “outward shell”, which he writes it is very difficult to make, so it shall not rot or crack. This outer layer was made either of tiles or of stone, often of very large slabs of marble, some other time of smaller pieces, and little square [Alb65]. There are other ancient pavements, continues Alberti, which were “made all of one piece”, composed by a “mixture of lime, sand and pounded brick, of each a third part”. This mixture, according to the author, could be made even more strong and lasting by the addition of a fourth part of “Tyber-Stone, beat to powder”, or of the sand of “Pozzuolo”, called “Rapillo”. This “plaster” designed for pavements was subjected to continual beating, which made it “daily acquire greater stiffness and hardness” and, if “sprinkled with lime-water and linseed oil”, it grew “almost as hard as glass, and defied all manner of weather” [Alb65]. Before going on with the description of the inner layers, Alberti mentions again the use of linseed oil as organic additives in flooring mortars: “Mortar worked up with oil, is said in pavements to keep out everything that is noxious”. Under the outer layer, it was made a layer of mortar, 8 – 5 cm thick, containing “small pieces of broken brick”. Next to this layer it was made a layer composed of brick and stone fragments, about 30 cm thick. The author refers that in some cases, between these two layers, it was interposed a layer made of “baked tile, or brick”. Finally, the bottom layer was composed of “stones, none bigger than a man’s fist”. These stones, writes Alberti, are those “found in rivers, as for instance, those round ones which partake of the nature of flint”, which “dry immediately when they are taken out of water”. For this reason, continues the author, “many affirm that the damps which arise out of the earth will never be able to penetrate to the shell of the pavement, if it is underlaid with those stones”. Alberti also describes the case of pavements built in Baths, which have the same structure of those above described but were laid upon a series of “pilasters a foot and half THEORY 5 high next to the ground, standing about two foot distance one from the other, upon which they laid baked tiles”. Finally, the author points out which are the most suitable conditions for the building of a pavement: “Pavements delight in damps, and wet air, while they are making, and endure best and longest in moist and shady places; and their chief enemies are the looseness of the earth, and sudden droughts”. Furthermore, he stresses out the importance of keeping the pavement wet, so it acquires good mechanical properties: “For as repeated rains make the ground close and firm, so pavements being heartily wetted, grow compact, and hard as iron”. As a conclusion of this paragraph about the mosaics‟ substrate in the ancient treatises, in Figure 1 is reported a graphic reproduction of a floor mosaic stratigraphy adapted from ancient literary sources by The Getty Conservation Institute and the Israel Antiquities Authorities, in the frame of the Mosaics In Situ Project [Mos03]. 1 – Statumen – First preparatory layer which is made of large stones laid on the ground, previously leveled and rammed. This layer only exists if the mosaic has been constructed on a natural soil. 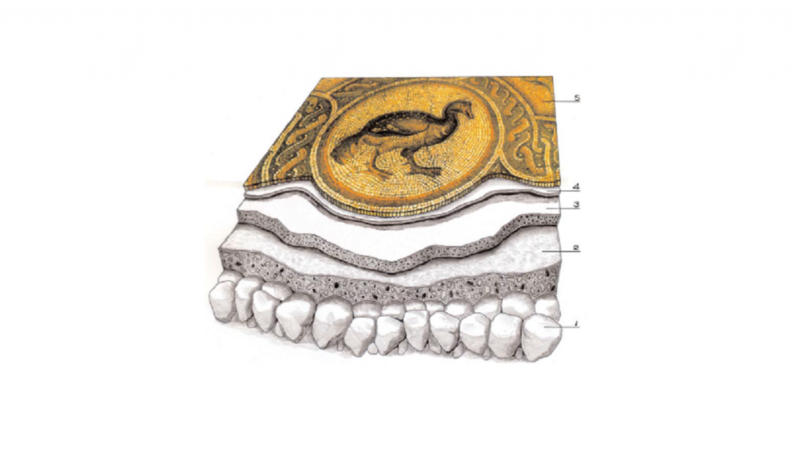 2 – Rudus – Second preparatory layer which is spread over the statumen. This layer is made of a lime mortar with large aggregates. 3 – Nucleus – Third preparatory layer which is spread over the rudus in a thinner layer. The nucleus is made of a mortar with fine aggregates. 4 – Bedding layer – Fourth preparatory layer of mortar which is very rich in lime, and thinly applied in small sections over the nucleus. Tesserae are inserted in this layer before the mortar sets. 5 – Tessellatum – Layer which constitutes the mosaic surface and is composed of tesserae and mortar filling the interstices between them [Mos03].